Pilot Landing Pass ONLY Required to Fly! Enjoy watching for FREE! 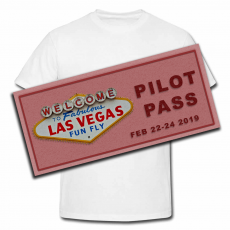 Early Registration Pilot Landing Pass for the Fabulous Las Vegas FunFly February 22 – 24 2019. Early Raffle ONLY ENTRY Prizes. Surprise offers from vendors who sponsor. Will update when more information becomes available. Saturday night COMPLEMENTARY "Gold Sponsor Hosted Dinner" Saturday night, You will not be disappointed. Menu based on availability and we will be posted prior to Event. Fabulous Las Vegas FunFly Pilot Landing Pass is processed by Enterprise Hobby. *Per requests added additional XL Sizes, We are only passing along the increase in cost for these XL sizes.